This page provides audio files where neuronal activity is "visualized" by creating music. The music is created from neuronal spikes recorded extracellularly with multiple electrodes, either from the parietal cortex of awake and naturally-sleeping cats (taken from Destexhe et al., J Neurosci, 1999), or from the temporal cortex of awake and naturally sleeping human subjects (taken from Peyrache et al., Proc. Natl. Acad. Sci. USA, 2012). 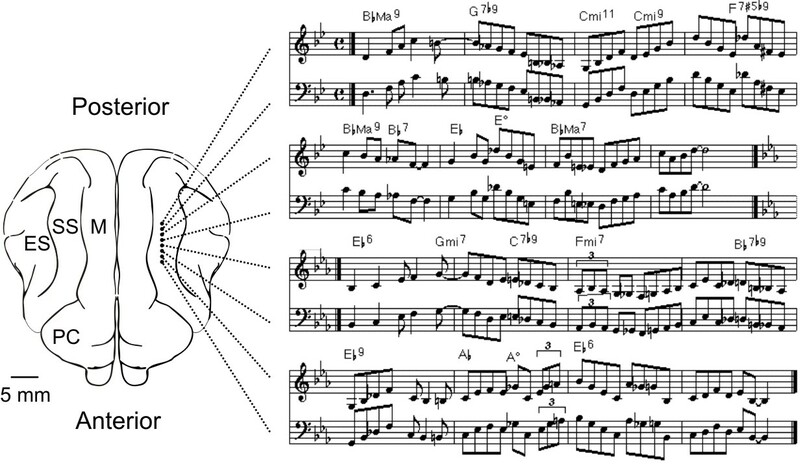 We have made two types of neuronal music, a first "simple" type, consists of a direct translation of spike sequences into note sequences, as detailed in the Neuronal Melodies page. This type of musical animation is available for cat parietal cortex and human temporal cortex. A second attemps was made more recenty, in collaboration with Luc Foubert (CNRS). In the Spikiss Project, we have created more elaborated music based on associations with multiple and sophisticated sounds. We also explained step by step how the conversion to music was made. We are presently continuing to work on the Spikiss project, and use spike recordings from human and monkey, as well as other types of signals, such as the electroencephalogram (EEG) or the local field potential (LFP).